We all want to see quick action in the stocks during their upward journey; however remember that quicker it rises and it can fall with the same pace. However; if the stock is rising slow and steady; it means that market is putting its faith behind the stock every day and thus it becomes a better bet than stocks which moves at a fast pace. 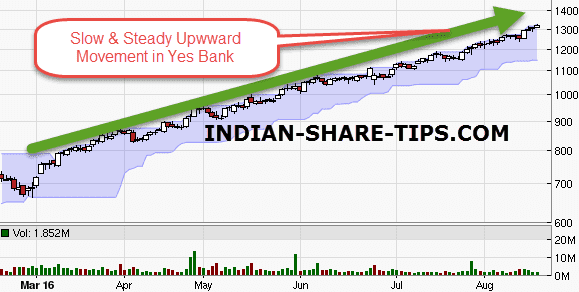 In this league we present below the chart of Yes bank which we have always recommended to hold in your portfolio as we find it among one of the best private sector banks and is a must in your portfolio for long term. Have a look at the chart now. Check our delivery stock tips now and if you are intraday trader than leave our sure stock tip of the day at your peril.